Primary mucosa-associated lymphoid tissue (MALT) lymphoma of the minor salivary glands in the upper and lower lips of a male paediatric patient. Mucosa-Associated Lymphoid Tissue (MALT) lymphoma is most commonly seen in older adults and has a female predilection. It is rare in children and extremely uncommon in the lip with only three cases reported in the lip of pediatric patients. In those reported cases the MALT lymphoma was isolated to a single lip. We report a case of primary MALT lymphoma in an immunocompetent male pediatric patient involving both the upper and lower lips. To the best of our knowledge, this is the first reported case. Lymphoma, Salivary glands, Oral pathology, Nucleoli. Mucosa-Associated Lymphoid Tissue (MALT) lymphoma also referred to as extranodal marginal zone B-cell lymphoma, is rare in the oral soft tissue [1-8]. Primary MALT lymphomas are most commonly seen in the gastrointestinal tract [1,2,4]. Within the oral soft tissue, the salivary glands are the most affected with the parotid gland being the most common site  and the minor salivary glands being the least common site . MALT lymphomas of the lip are exceptionally uncommon with few reported cases in the literature [1-3,8,10]. Middle aged and older adults exhibit the high highest frequency of MALT lymphomas. Pediatric cases are exceedingly rare and are most often associated with immunocompromised patients [3-8,11]. A female predilection is seen in both the pediatric population  as well as in the adult population [4,6]. All the reported case of MALT lymphoma of the lip has been isolated to a single lip. This paper, to the best of our knowledge, is the first reported case of primary MALT lymphoma of both the upper and lower lips. A fifteen-year-old male presented to an oral surgeon for evaluation of a mass in the upper right lip that has been present for one year. The medical history revealed the use of growth hormone for diminished stature but was otherwise unremarkable. Examination of the right internal lip revealed normal mucosa overlying a soft, non-tender mass measuring 3.5 × 3.0 × 3.0 cm (Figure 1). Further examination revealed two non-tender soft tissue masses on the left and right lower lip (Figure 2). The clinical impression was that of a benign salivary gland tumor with a differential diagnosis of pleomorphic adenoma or monomorphic adenoma. An excisional biopsy of the upper lip lesion produced a rounded multilobular soft tissue mass approximately 3.0 cm in diameter (Figure 3). The lower lip lesions were not biopsied at this time as benign salivary gland tumor was the expected diagnosis and these lesions were going to be removed at a later time. The tissue was sent to oral pathology for evaluation. Histology showed regional mucous gland lobules being replaced by a tumor composed of diffuse sheets of neoplastic lymphocytes admixed with aggregates of plasma cells and collections of epithelioid histiocytes (Figure 4). The lymphocytes contained medium sized vesicular nuclei with some cells having prominent nucleoli (Figure 5). A tentative diagnosis of lymphoma was made and the specimen was sent out for Immunohistochemical analysis. The neoplastic cells expressed positivity for CD20 and CD79a. The plasma cells showed IgA kappa light chain restriction. The case was reviewed at an intradepartmental conference with the consensus diagnosis of mucosa associate lymphoid tissue (MALT) lymphoma. An added comment to the report was “although pediatric lymphoma of the lip is rare, it has been reported in the literature”. The patient was sent to oncology for evaluation where the two smaller lesions on the lower lip were biopsied (Figure 6). Biopsies confirmed the diagnosis of MALT lymphoma. Further evaluations confirmed that the patient had no chronic inflammatory disease and was not immunocompromised. Positron emission tomography scans were negative for other site involvement. The treatment plan recommended by oncology was for surgical removal of the lesions with no chemotherapy or radiotherapy with reevaluation in three months. Figure 1. A soft non-tender mass in the right upper lip measuring 3.5 × 3.0 × 3.0 cm. Figure 2. Two non-tender soft tissue masses found at examination on the right and left lower lip. Biopsies confirmed the neoplastic tissue was MALT lymphoma, the same as in the upper lip. Figure 3. Excisonal biopsy of a round multilobular mass in the right upper lip. Biopsy was diagnosed as MALT lymphoma. Figure 4. 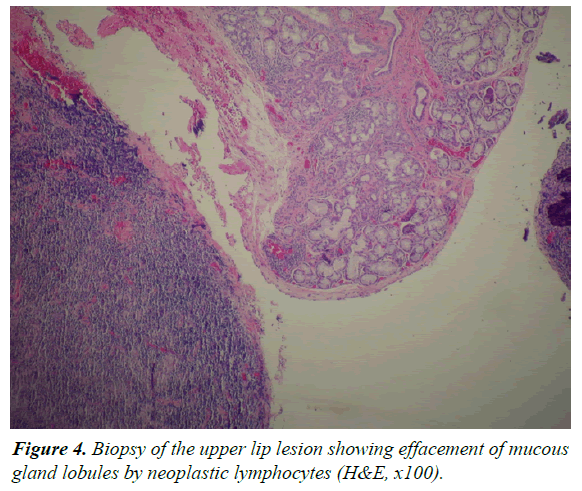 Biopsy of the upper lip lesion showing effacement of mucous gland lobules by neoplastic lymphocytes (H&E, x100). Figure 5. Biopsy of the upper lip lesion showing medium sized neoplastic lymphocytes with collections of epithelioid histiocytes. Figure 6. Excisional biopsies of the right and left lower lip lesions. Lesional tissue is similar to that excised in the upper lip with biopsy confirmation of a MALT lymphoma. Mucosa-associated lymphoid tissue (MALT) is specialized lymphoid tissue that lines mucosal surfaces such as the gastrointestinal tract and the bronchi and functions as an immune defense against antigens entering through mucosal surfaces [6,9,11]. MALT lymphomas generally present as low grade B-cell lymphomas [4,6,11,12] with indolent behavior [3,4,6] however, some tumors transform into more aggressive high grade lymphomas [6,12]. The Immunohistochemical staining typically demonstrates positivity for CD20 and monotypic staining for either Κ or λ light chain immunoglobulin markers or negative staining for CD3, CD5 and CD43. The pathogenesis of MALT lymphomas has been associated with chronic inflammation and immune disorders such as Hashimoto’s thyroiditis, chronic gastritis associated with Helicobacter pylori infection and, in the salivary glands, myoepithelial sialadenitis (MESA) and SjÖgren’s syndrome [1,3,4,6,8,11]. There has been one reported case of cutaneous MALT lymphoma associated with Borrelia burgdorferi infection . Patients with MESA and SjÖgren’s syndrome are at an increased risk of MALT lymphoma with a greater than 40 fold increase in risk for patients with SjÖgren’s syndrome [9,12]. Anacak et al. estimated a 5.8% prevalence of MALT lymphoma in patients with SjÖgren’s syndrome when the salivary glands are involved. The increased risk associated with MESA is attributable to many lesions being a component of SjÖgren’s syndrome. Many salivary gland lesions that formally would have been diagnosed as benign lymphoepithelial lesion are now being diagnosed as low grade B-cell lymphomas (MALT lymphomas) and are due to the use of modern molecular pathology techniques . The most common location for MALT lymphoma is in the gastrointestinal tract [1,2,4,6,11] with the stomach being the most frequent site affected [5,8]. The association of Helicobacter pylori and MALT lymphoma of the gastrointestinal tract is well established . Berrebi et al. reported a case of MALT lymphoma of the lip in an immunocompetent child with gastric Helicobacter pylori infection that regressed after treatment of the infection. MALT lymphomas are a disease of older adults and are extremely uncommon in the pediatric population. Most reported MALT lymphomas in pediatric cases are associated with immunodeficient children; however, there have been three reported cases of MALT lymphoma of the lip in pediatric patients that were not immunocompromised [3,8,10,11]. MALT lymphomas have a female predilection both in the adult [4,6] and pediatric population . With a 9:1 female to male ratio , it has been speculated  that the female predominance of MALT lymphoma in salivary gland tumors is influenced by the higher rate of SjÖgren’s syndrome seen in women. 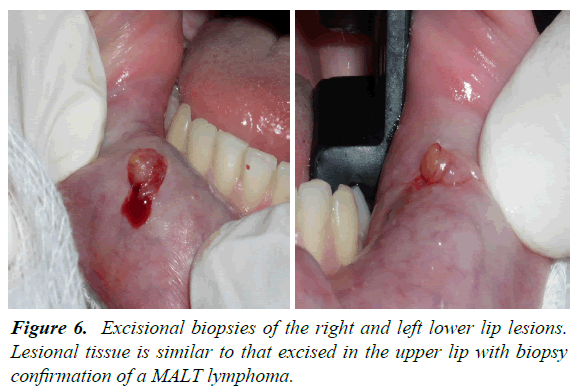 MALT lymphoma of the oral soft tissue is a rare entitiy [1-7]. In the oral soft tissue, the salivary glands are the most common site with the parotid gland affected most frequently [4,8,9,11]. MALT lymphoma of the lip is extremely rare with only four cases published in the literature, and only three of these in pediatric patients [1,3,8,10]. Unlike the other reported cases of MALT lymphoma which were isolated to a single lip, the present case is in both the upper and lower lips, which to the best of our knowledge is the first reported case. Of the three pediatric cases, one was a cutaneous lesion and the other two, like the present case, were associated with minor salivary glands. All three pediatric cases and the present case were in immunocompetent children, which is not a common finding. Of the two salivary cases, one, Berrebi et al. was associated with a chronic infection and was discussed previously. The second case reported by Ryu et al. like the present case showed no signs of infection or immunological disorders and positron emission tomography scan were negative for other sites of involvement. There is no optimal standard treatment for MALT lymphoma of the salivary glands  and the treatment options include surgery, chemotherapy (e.g. CHOP, Rituxamab), radiotherapy and combined modalities [1,2,4,6,7,11]. In a multicenter rare cancer network study that looked at different treatment modalities and MALT lymphoma involving the salivary glands, Anacak et al. concluded that disease free survival time was best achieved with radiotherapy. In the case of Ryu et al. surgical excision and chemotherapy with cyclophosphamide, vincristine, prednisone, cytarabine and methotrexate were administered with no recurrences after six months. Berrebi et al. case was treated with antibiotic for Helicobacter pylori with complete remission for the lymphoma. Sakuma et al. reported a case of a 70 year old women with SjÖgren’s syndrome and MALT lymphoma of a minor salivary gland that had not treatment and the lymphoma spontaneously regressed. In the present case, surgery was the only treatment given and the patient will be reevaluated in three months. As illustrated above, treatment of MALT lymphoma associated with salivary gland tissue can be achieved by a variety of treatment modalities and after adequate treatment, pediatric MALT lymphoma have better disease free survival and recurrence free rates than other non-Hodgkin’s lymphomas with 80-95% five year survival rates . In conclusion we have reported a very unique case that encompassed several individually rare characteristics of MALT lymphoma in one patient and have added the occurrence of simultaneous MALT lymphomas of the upper and lower lips in a pediatric patient to the literature. Niscola P, Palombi M, Fratoni S, et al. 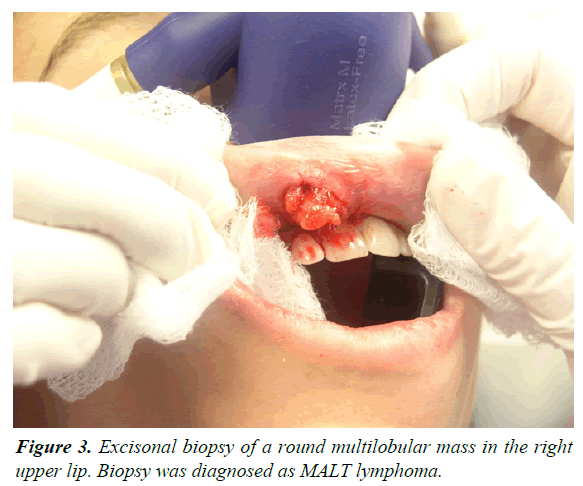 Primary MALT lymphoma of the upper lip mucosa: an exceptionally rare localization. Int J Hematol. 2009;89:130-1. Miller RI. Non-Hodgkin’s lymphoma of the lip: A case report. J Oral Maxillofac Surg. 1993;51(4):420-2. Berrebi D, Lescoeur B, Faye A, et al. MALT lymphoma of labial minor salivary gland in an immunocompetent child with gastric Helicobacter pylori infection. J Pediatr. 1998;133(2):290-2. Anacak Y, Miller RC, Constantinou N, et al. Primary mucosa-associated lymphoid tissue lymphoma of the salivary glands: A multicenter rare cancer network study. Int J Radiat Oncol Biol Phys. 2012;82(1):315-20. Kojima M, Nakamura N, Shimizu K, et al. Histopathological variation of primary mucosa-associated lymphoid tissue lymphoma of the oral cavity. Pathol Oncol Res. 2007;13(4):345-9. Bhattacharyya N, Frankenthaler RA, Gomolin HI, et al. Clinical and pathologic characterization of mucosa-associated lymphoid tissue lymphoma of the head and neck. Ann Otol Rhinol Laryngol. 1998;107(9):801-6. Sakuma H, Okabe M, Yokoi M, et al. Spontaneous regression of intraoral mucosa-associated lymphoid tissue lymphoma: Molecular study of a case. Pathol Int. 2006;56(6):331-5. Zambrano E, Mejia-Mejia O, Bifulco C, et al. Extranodal marginal zone B-cell lymphoma/maltoma of the lip in a child. Case report and review of cutaneous lymphoid proliferations in childhood. Int J Surg Pathol. 2006;14(2):163-9. Isaacson PG, Norton AJ. Extranodal lymphomas. Histopathol. 1995;27(1):97. Ryu M, Han S, Che Z, et al. Pediatric mucosa-associated lymphoid tissue (MALT) lymphoma of lip: a case report and literature review. Oral Surg Oral Med Oral Pathol Oral Radiol Endod. 2009;107(3):393-7. Wolvius EB, van der Valk P, van der Wal JE, et al. Primary non-Hodgins lymphoma of the salivary glands. An analysis of 22 cases. J Oral Pathol Med. 1996;25(4):177-81. Neville BW, Damm DD, Allen CM, et al. Oral and Maxillofacial Pathology. 3rd edn. WB Saunders; 2008.